I haven’t read a great deal of spy fiction in recent years, although I liked John Le Carré when I was a teenager. 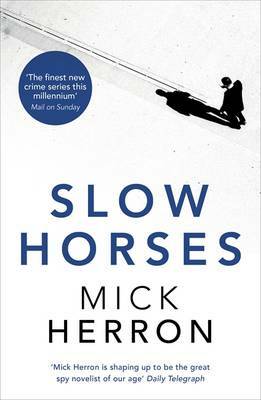 However, I heard Harriett Gilbert praising Mick Herron’s Slow Horses on BBC Radio 4’s excellent book programme, A Good Read, and decided I’d give it a try. My favourite spies tend to be the shabby, somewhat down-at-heel, very British ones – more Smiley than Bond – and Slow Horses provides these in abundance. The ‘slow horses’ of the title are MI5 agents who have been shunted off to Slough House, a grubby satellite office, because they aren't considered competent or trustworthy. Each one has, at some point in their career, made a terrible or embarrassing error that renders them fit only for the dullest and most routine of intelligence tasks. Overseeing this mismatched bunch is Jackson Lamb, a charmless, shambolic slob who frequently expresses himself through the medium of flatulence. The most exciting things the slow horses usually get to do are going through bins and monitoring chatrooms, but when a 19-year-old student is abducted and held hostage by terrorists who threaten to behead him live online, there seems to be a tenuous link to some of the slow horses' routine non-operations. Gradually, Lamb's team become drawn into an increasingly dangerous and complex set of events that could not only culminate in a young man's decapitation but could also end what few shreds of a career the slow horses have been allowed to retain. The plot is as complicated as you'd expect from a spy novel, full of misdirection, bluffs and double-bluffs; you do have to read carefully to keep track of what's going on. It starts at a fairly slow pace, which I know will annoy some readers, but it soon picks up and develops into a tense story with numerous cliffhangers. However, it's the characters as much as the action that make Slow Horses such a cracking read. It has a large cast and even the bit-players feel uncannily real. Lamb is a thoroughly entertaining anti-hero and his team, every one of harbouring some level of bitterness and regret, are such a tragic bunch that's impossible not to root for them even they're being unpleasant - which is often, particularly to each other, and makes for some particularly smart, witty dialogue and gallows humour. It probably says a lot about me that I prefer spy novels that are about a bunch of barely competent losers, but I enjoyed Slow Horses a lot and will definitely be reading the others in the series.